This is a very nice program that allows you to find out the target to hit numbers to an enemy 'mech using the computers. The only drawback to the program is that you cannot save 'Mech configs. You have to redo them each time you use the program. The first batch of pictures are from official BattleTech Universe products. I plan on using some non-BattleTech art in the future, but my first priority is BattleTech pictures. This is a collection of custom BattleForce record sheets I designed. These files take the official BattleForce record sheets, do some major rearranging and make them look like the standard baseball or CCG card. They are designed to be printed at the standard 2.5 inch by 3.45 inch size of the standard trading or collectable card and can be slipped into any card protector designed for them. Do not let the printer resize them. Print at actual size for best fit into card sleeves. They can be used to play standard BattleForce, but are designed for use with the QuickStrike rules and are what I use them with. In my experience, they are highly visual and are great for introducing new players into playing in the BattleTech universe. :) The Blank files have Photoshop and PNG files in them so you can make your own cards and the stat files have just PNG files to save on space. Templates - I use these to make new cards. They are based off the official BattleForce record sheets. Blank Pages - I input cards into these sheets to print them out. Card Backs - I print these out on the backs so my cards look cool. Stats - These are files made by nckestrel of the Master Unit List team and first published on the CBT forums. They provide stats for most of the canon units that you can use on any of the blank cards I provide here. They are in pdf form. Vehicles - Uploaded 08-19-2010 - Also in TRO 3039. BattleMechs - Updated 10-15-2010 - Newly Introduced 'Mechs only BattleMechs - Inner Sphere - Updated 5-12-2010 - All units, not all configurations, high tech versions of 3025 'Mechs. BattleMechs - Clan - Updated 5-19-2010 - Assorted units, not complete. Battlemechs - 3055U - Updated 10-15-2010 - Clan Phoenix and Solaris VII sections BattleMechs - Inner Sphere - Updated 5-19-2010 - All units, not all configurations. BattleMechs - IS - Updated 6-11-2010 - All units, not all configurations. BattleMechs - Clan - Updated 6-11-2010 - Assorted units, not complete. BattleMechs - Updated 7-5-2010 BattleMechs - IS - Updated 7-5-2010 - All TRO configurations. WarShips - Uploaded 9-15-2010 BattleMechs - IS - Updated 8-18-2010 - All units, not all configurations. I have put together lists of 'Mech, Vehicle, and Aerospace special abilities based on fluff that, due to demand, I am placing on PRI. Unfortunately, I have somehow lost them all and only through a fair amount of luck was able to retrieve the 'Mech list. I will attempt to rebuild the Vehicle and Aerospace lists in the future. Bedwyr has made some of the best player-made tables for the BattleTech games I've ever seen and I very proudly place them up here in their own area for you guys to use. If you play any of the BattleTech games, these will be invaluable to you as you won't have to flip open the book every time you turn around. Thanks very much Bedwyr for the files. Here is an awesome reference for people who wish to use support elements in their BattleTech campaigns. Complete with information relevant to each major faction, and descriptions of everything from shipping containers to medical support, this is by far one of the best collections of information I have ever seen. It is Boilerman's brainchild and work here which was PDFed by Discord. It rocks. Designed for use with the TI-86 calculator, this automatically rolls 1D6, 2D6, missile hit tables, or damage locations. This is a very nice little utility. Now if only someone would something like it for the Palm OS...hehehe. Thanks for the link Webmaster Coolman. This program calculates the Dragoon's Rating of a Battletech mercenary unit. The calculator is in a simple to use wizard format to guide you through the calculation. This uses the rules found in FASA's Field Manual: Mercenaries sourcebook, which is almost identical to the previous versions of the rules. Update 06-02-2003 - The old webpage was down. I did a search on the web and found the new one and have changed the link on my page. Update 03-22-2004 - The new webpage appears to have problems linking to the downloads page. I was able to play around a bit with the address bar, get to it, and obtain the program file. I now provide it here. This page has dice rollers, BV balancers, Line of Sight Calculators, and a page that creates BV for custom weapons. There are some other things there as well that you may find funny and interesting. All of this comes from the mind of the dude who makes and sells the HeavyMetal line of BattleTech software. He SOOO rocks. This nice little program helps you create a character to look like however you want them to look. Very nice for visualization. It is currently free but the author is making a new and much more powerful version of the program that will be pay only because he is paying for lots of bandwidth. In an effort to help his bandwidth go down a bit, I'm suggesting that you download the file here. He has said I can host the file here so don't worry about that. To run the program, simply unzip it into a directory and open up HeroMachine.html. It uses flash and works entirely inside of your browser. This is a very good program and I recommend it highly. This is an interesting program. I like it as it allows for the use of unencrypted files unlike the Inner Sphere Planetary Locator so we can make our own map files to be viewed in it. Unfortunately, it only uses the 3052 factions, so you have to tell it that systems are one of those types of factions. The included file works, but only the factions on it are coded into the engine. Also, you can right-click and drag to find out how many lightyears is between systems. However, the calculation is wrong. Actual distance is approximately 2.7 times that given in the program. Built by me using Mike Flynn's Inner Sphere Cartography Society datafiles as a start, these files have corrected several small errors in the ISCS files. I've also been updating it with new systems that are being put into the universe. These files are optimized for use in Rick Raisley's HeavyMetal Map (in early beta testing for over a year) software that has been in testing for a while, but they do work in the Inner Sphere Map program too as each program currently uses the same file structure for loading maps. Here is a nice little program that gives you the location of every planet in the Inner Sphere and the affiliations of them in each of the major time periods. Now it isn't perfect, as the Periphery worlds are wacked out as far as position goes, and the ownership of Chaos March worlds in 3058 not correct, but this program does generate jump paths for moving planet to planet, a very nice capability for campaigns. These must be installed before you can install the ISPL program. My experience is that if you install TDB first, you will not need to install these files before bringing up ISPL. Note: These are the same files required for the Vehicle Factory progs. If you get a "missing threed32.ocx" error then you use a newer version of Visual Basic on your computer that does not support some of the older controls in previous versions of VB. Unzip this file into your windows system directory, click START, RUN and then type "REGSVR32.EXE /C THREED32.OCX" into the dialog box. That should make the program work correctly. It worked for me. For further directions from IBM, click here. What do you want? Random dice rolls? World maps? 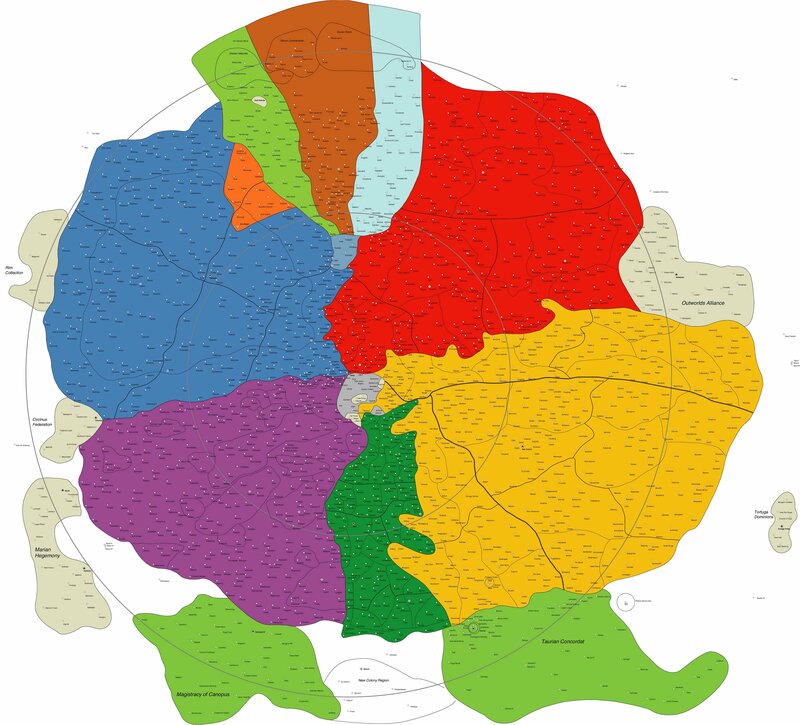 City maps? Tavern layouts? They may not be the most graphically impressive maps out there, but it's better then designing the utilities to make them yourself. Very sweet and definitely worth a look. Four programs made by Nic Jansma that you can use to play Battletech or MechWarrior 2nd Edition. The first three need no explanation, but the fourth does. 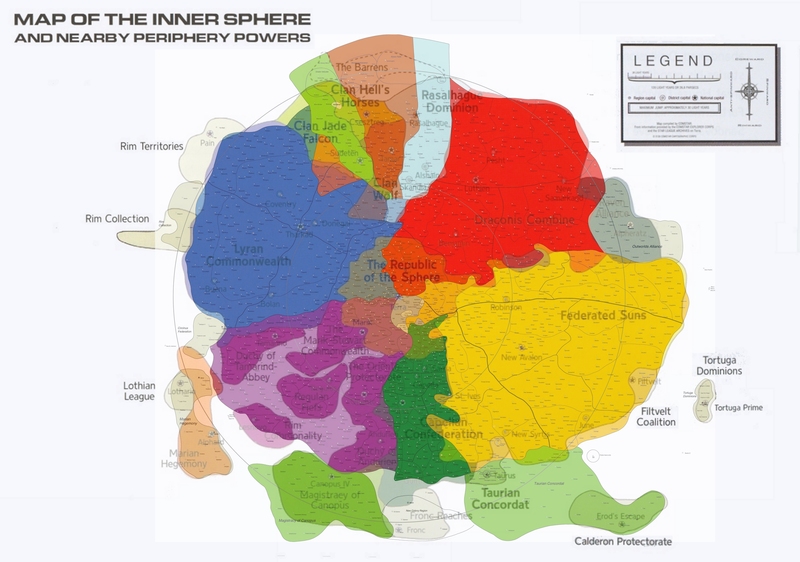 You can randomly generate any unit from a small raiding party on up to a large planetary garrison in the time period of 3025 through 3055 for both Inner Sphere and Clan affiliations split up by each individual faction. A very nice prog. Many people who play with Land-Air BattleMechs have been looking for updated rules for years now but they have been slow in coming. The last official rules were published in FASA's Tactical Handbook, though a limited quickstart set of rules were printed in Catalyst's Record Sheets 3085. There is also a set of rules in the Beta release of Interstellar Operations that generated several metric tons of electronic discussions. It is unknown how much of that will make it into the final printing due to their lack of popularity in the fanbase. Now the people who make up the HeavyMetal forums were working on LAM rules years ago. I recently dusted off every set of rules we had worked on, mostly based on FASA's Tactical Handbook since that was the last official rules at the time. I started discussion of the rules again on Heavymetal and we worked over some of the new Catalyst-era issues. The rules now include elements taken from Record Sheets 3085 and the Interstellar Operations Beta release, though are still based primarily on the Tactical Handbook rules. The main idea was to make LAMs easy to run, fun to play, and fun to play against. These are not the munchkin rules that some may have been traumatized by. ;) It is my hope that you enjoy them. Much hard work and angst went into them. Hehehe. These are Thompson's spreadsheet upgraded to work with the rules in the Revised Mercenary Field Manual. A fair bit of work was entailed in doing them and they look good IMHO. Version 2 is significantly improved over the first version, but I'm keeping both up so you can choose which you want to use. Thanks for sending the sheets to me dude. Better, but much more complicated, sheet that helps you to perform unit management. It even has the relevant stats of every unit I know of in BTech and BSpace/AT2 already entered in so all you have to do is type in the unit class and it pulls up the maintenance information for it. I'm very impressed with this thing at a first glance. Very impressed. This can create a contract for a mercenary unit with the rules found in the Mercenary Handbook 3056. One thing that would be nice to see for this is the ability to print contracts. But overall, it is a decent program. I was impressed that someone did this. Update 03-22-2004 - The new webpage appears to have problems linking to the downloads page. I was able to play around a bit with the address bar, get to it, and obtain the version 3.2 program file. I was unable to obtain versions 1, 2, or 4, but I now provide 3.2 here. Below are programs designed to run on Palm Pilots to support BattleTech play. This program calculates line of sight for BattleTech games. The output looks much like the elevation level worksheet in the Tactical Handbook. - Thank you Zilaz X'Savior for this program. PocketC - This program must be installed or the LOS program will not work. This program determines hit locations and critical hits randomly. This is where I collect the various maps designed to accurately show the universe of BattleTech. 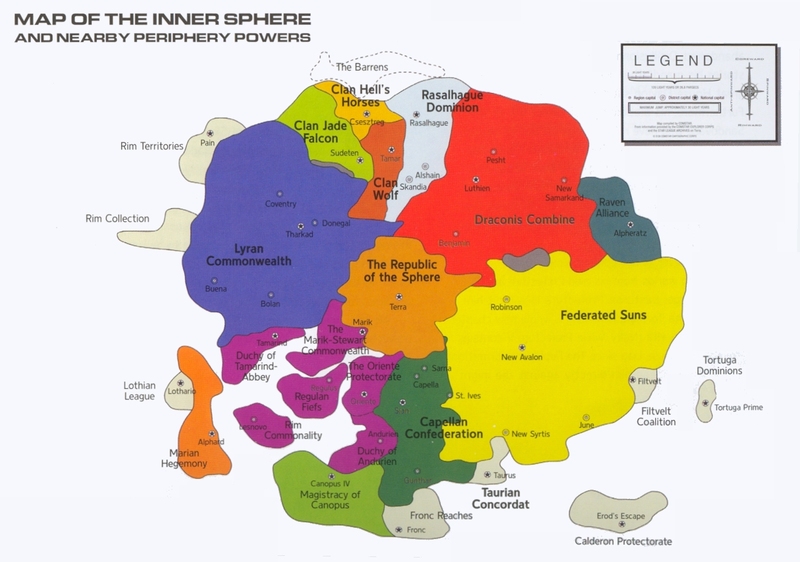 3064 Inner Sphere - Taken from Classic BattleTech. 3132 Inner Sphere - Taken from the Technology of Destruction MechWarrior Hardcover book. 3132-3064 Inner Sphere Comparison - The TOD and CBT maps combined by me for comparison purposes. This is a cool php utility that will generate random skills for your warriors. It works in the browser or you can download it if you wish to. This was written and sent to me for inclusion in the P.R.I. database by ralgith a.k.a. Dylan Myers. We both hope you enjoy this program. A nice program for making quick and easy tables. You can make a table for choosing the weather, random encounters for MechWarrior, or random 'Mechs for BattleTech. Or frankly, anything else you want. This is freeware and was made by RCW enterprises, the maker of HMP. Version 2 is far more powerful and if you've never used it I'd suggest trying it out. A set of tables I am making to more fully show the BattleTech universe of 'Mechs and all that jazz, now in a handy travel size. For instance, rarer or abandoned 'Mechs stay on the lists as they increase in tech, they just become very rare by tech A. This table includes the five major houses, Comstar and Word of Blake, the Free Rasalhague Republic, St. Ives, Mercenaries, and the different Periphery factions from 3025 to 3063, the final date being decided by the Field Manual. All the tables are separated into directories to make them easier to navigate. A set of files for generating random dates if you want to do that for a campaign or anything else. Cool. These files are updated because the other files I have for BMR are incorrect. Thanks for the help dude. RUS BMR Lance-Star-Pilot Tables Uploaded 4-21-2004 - BMR company, lance and star creation files, as well as the random pilot tables. From MaxTech, these are the Level 3 hit tables for 'Mechs and vehicles. This includes just about every official random 'Mech, ASF, or vehicle table from just about every faction from every Field Manual and I'm thinking AT2 as well. This is a truly massive list. The original archive I was given included my enhanced "historically correct" files so I delled them from the archive. Don't want to pass them off as official after all. Just correct...:-). This is a rather involved set of files. They include the BMR random 'Mech lists, as well as the company, lance and star creation files from that book. They also include the random pilot tables from BMR. Different from most tables I host, these are the hit tables from AT2. These are the actual tables to the best of my knowledge with no changes. The tables from AT2 and the Outworld's Alliance tables from the Periphery FM, these are the actual tables the generate random fighters with no changes. A nice little excel spreadsheet that figures out the damage, delay, heat, and all that jazz for all known weapons for the Solaris 7 rules of combat. Very nice if I say so myself. Two modified versions of the tables in the back of the BattleTech rules books that you can print off and take to a game. They are easier to use and have some short explanations as well. Very nice additions. Thank you Nathan for sending them to me. Another table courtesy of Nathan, this shows the stats for almost all of the level 1 and level 2 weapons and equipment. I noticed that it does not include any armor, but seems complete otherwise. Thanks dude. Wintertree Software made many very good programs for RPG enthusiasts. Perhaps the best of these is Table Master, a program that you can use to randomly determine results from any kind of table. I have designed files for it that allow you to generate Clan and Inner Sphere pilots, and Inner Sphere 'Mechs for each of the factions in the Battletech Master Rules and Mechwarrior 2nd Ed. 'Mech tables. Random encounter tables or anything else can be made with this software. Since the Wintertree Software link is down and I have been unable to find it anywhere on the web, I have uploaded a working copy of the program. This is NOT the shareware version and is provided with the knowledge and permission of the original author. I made three tables here for use with TableMaster. One is a simple warrior table that randomly generates a pilot for either IS or Clan affiliations. I also set up two tables (one for lances and one for companies) that follow the rules in Battletech Master Rules for random generation. They have tables for all Inner Sphere factions in the BMR and in the old MechWarrior 2nd Edition. I also entered a Taurian Concordat listing into the table which was for an old RPG I was in. They are the only listings not FASA published. No Clan listings included. These are the official Wintertree Software demo tables that came with the shareware version of the program. The author of this program sent me these files after he found my site. If you use this amazing program, I hope you will find these interesting and enjoyable. A table that randomly generates way stations for the Exile roleplaying system. A set of tables to do everything from creating phobias, generating adventures, and towns, to names and weapons. Nice stuff there. Tables that make jewelry, NPCs, personalities, spell books, and more. Tables for finding places to sleep in a desert, contemplate the meaning of life, or to try your hand at using cards to foretell the future. Nice and amusing little set of tables. This is an official Wintertree Software pack that they charged for in the past. The original author has given me permission to host them here. Thank you Discord for finding these packs for me. Built using the system rules in Explorer Corps as a basis but with his own revisions, Revanche sent these tables to me so I could post them. Unfortunately, at this time I do not have a working copy of TableMaster so I have not yet tested them. An old online friend T-Bolt made these tables here for use with TableMaster. The tables in this listing are simply lists of mechs, vehicls, fighters, and spaceships that are randomly selected. These are not as indepth as the ones I made, or as the program Mishima is writing, but they do offer more units (like the Clan 'Mechs and the fighters and spaceships) then either of what we have included. Another piece of software written by Wintertree Software, this is similar to Rick's RUS. It takes tables and randomly selects the entry for display. I prefer RUS, but if you've never gotten out to buy any of his programs, this could work for you. Thanks to James Miller for finding this program and giving it to me. I'm trying to pick up all of the old Wintertree Software and jazz so it doesn't disappear forever as the company went out of business some time ago. Another piece of software written by Wintertree Software given me by James Miller. He wrote the following note about it. "The FXMaster is the sound program from Wintertree. It's was designed to surf through your wav files, and then set them up in the 5 section menu, so you could play them as sound effects during your game. (Remember: This was designed for Win 3.1! It's old, but works well...) Don't try to install it. Just delete the installer, and use the FX program itself."